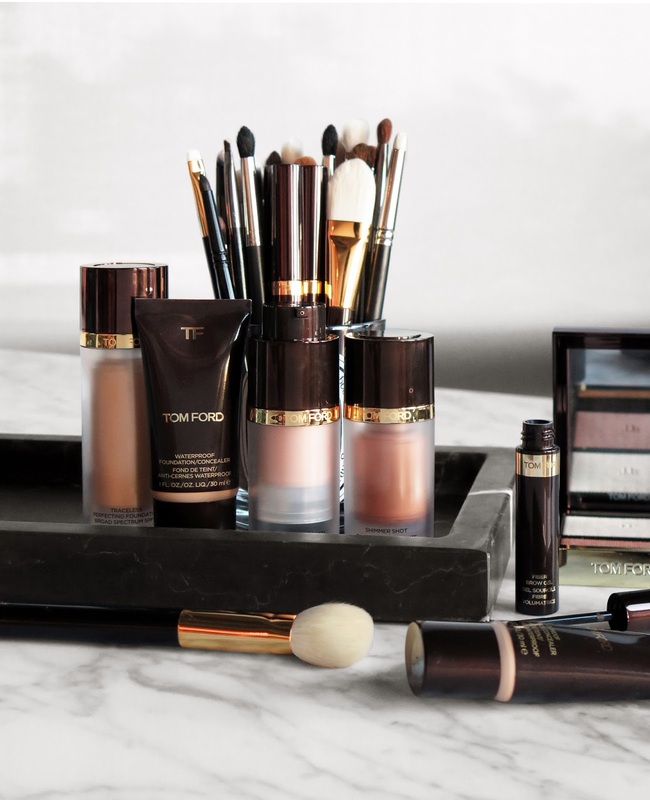 For spring Tom Ford Beauty brings us two new colors of the Shade and Illuminate Cheeks ($80 for .49 oz) and six new lip duos called Shade and Illuminate Lips ($60 each for .12 oz). The cheek duos are very sheer, glowy and dewy looking while the lip duos have medium to full coverage pigment and a unique modern velvet matte cream finish. Paired together they make for a fresh kind of look for spring with options for those who want neutrals and also those who like more color. The Shade and Illuminate Cheeks has never really been something that appealed to me mainly because of the dewy factor. I approach solid creams compacts with caution because they often get really messy inside the pans and also because I have normal combo skin. Most dewy pots and compacts are simply too dewy and glowy for my skin alone although I have used them as a nice base for powder blush. They help the color adhere better versus applying on dry powdered cheeks. 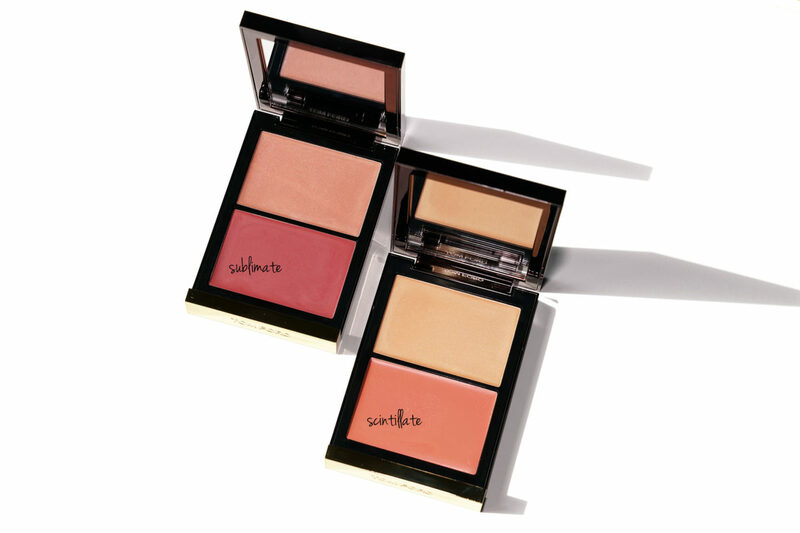 My holy grail cream highlighters are the Edward Bess All Over Seduction compacts (available in 3 shades). I’ve been using them for many many years and they remain my favorite. The two new Shade and Illuminate Cheeks are gorgeous in the pans. Sublimate has a soft berry with a soft pale pink glow. Scintillate has a pretty light peach with a light champagne glow. On the cheeks they give a barely there hint of glow and color. I do like them as a base for powder blushes but by themselves on the cheeks they almost disappear onto my medium-toned skin. If you want a little bit of glow to dab on top of powder or use underneath these are worth a look. If you need color I would recommend opting for the Tom Ford Powder Blush instead – it appears they’ve all been reformulated with a new more refined pearl finish and there are three new shades in Disclosure, Gratuitous and Inhibition (I ordered 2 and they are gorgeous!). Swatches compared to the SS16 Shade and Illuminate (review here) and Cream Cheek Color in Pink Sand (review here). The new Spring 2017 duos were swatched heavily so you can see the color, but once you blend them they pretty much sheer out to almost invisible. The Shade and Illuminate Lip exceeded my expectations and every color is just amazing. These are duo compacts that have two shades and a little applicator brush. The applicators have a sponge tip and a brush tip – I tried both but really just prefer to use clean fingers to dab or a regular lip brush. Swatched on the arm and hand they almost melt to a high shine cream finish. On the lips they are more matte with a velvety cream texture. When I read these were contour duos I was really skeptical – it just seemed like a gimmicky way of being complicated and trying to make you feel like you need two colors instead of just one. After trying these I can really appreciate the versatility and design. You can wear each shade alone, but mixing them creates a better look in my opinion. I like to apply the darker shade first then dab the lighter one on top mixing the two for a creamy almost stained look. I swatched all six individually and mixed so it was like swatching 18 lip products instead of 6. Due to time constraints I won’t be able to pull any comparisons for the next month. If you follow me on social you know I just had my wisdom teeth pulled (all 4). Swelling finally went down a little and I was able to get these up for those who shop online or who don’t test lip products at the counter (I’m with you there on avoiding germs). I have a few personal things going on right now so I’ll be restricted on time over the next month. My long-time readers know I love neutral lips, but I can’t help but really like Possession and Tantalize! I find it hard to wear bright pinks because many times they’re too cool, too bubblegum or have way too much blue. Possession has enough warmth that I can wear it without it making my olive complexion look off. Tantalize mixed is such a pretty coral especially for warmer months. My absolute favorite is Impulse though – it may look a bit boring to some but if that’s the case then I love boring. The deeper rose shade is really special. As a long-time Tom Ford Beauty fanatic I’m really happy with the lip duos. The Shade and Illuminate Cheeks are nice but not must-haves. If you like products like the RMS Living Luminizer or RMS Mix Master then you’ll most likely love these as well. For me they’re a bit too dewy and if you have oily skin I would definitely say pass. If you want something fresh and glowy for the cheeks I’d recommend you opt for the Cream Cheek Color in Pink Sand, Cheek Color (any shade) or the Sheer Cheek Duo in Bicoastal instead. You can find the Tom Ford Shade and Illuminate Spring 2017 collection now online at Tom Ford, Nordstrom, Saks Fifth Avenue and Beautylish. Spring 2017 Shade and Illuminate collection provided courtesy of Tom Ford Beauty for review.